Last days. There are a lot of last days coming up for my family and I. But yesterday was my last day of work. The last day I commuted into Manhattan. The last day I needed to catch the bus. The last day I will gaze out my office window at the Chrysler building. Normally last days of work are filled with excitement about the impending freedom... at least in my logical mind, that's how it should be. Maybe I'm too sentimental but this last day filled me with anxiety, shortness of breath and minor panic attacks. The finality of this move was hitting me. It was hard to catch my breath as I wrote my farewell email. And the knot in my stomach never seemed to loosen as the day went on. Leaving my tight knit group of co workers was sad and it didn't dawn on me that it would be so hard to say goodbye. These are the people you share you life with, and now I'm leaving them and the part of my job I did love. I hope that staying in touch won't just be words we say to each other as I past through those glass doors. But life always has a way to turning good intentions into unintentional lies. Whether we do or not, I'm in dire need of some comfort. For some it's a glass of wine, but for me, it's dessert. So on this first day of my new life, I've decided to eat my feelings for a little bit of comfort. And what's more comforting that donuts? Well, for me, Ube donuts with a Coconut Glaze. Ube has been popping up everywhere and I could 't wait to get my hands on it. unfortunately finding actual Ube in my grocery store was harder than I expected. So I found Ube extract instead. Same great flavor and color, without the boiling and mashing. Though, if I could find the real thing in Texas, I'll go for it. Donuts have always been a point of contention in my family. What's better cake donuts or yeast donuts? I for one have always been partial to yeast. With the exception of certain flavors like the tres leches donut from Donut Plant in NYC. 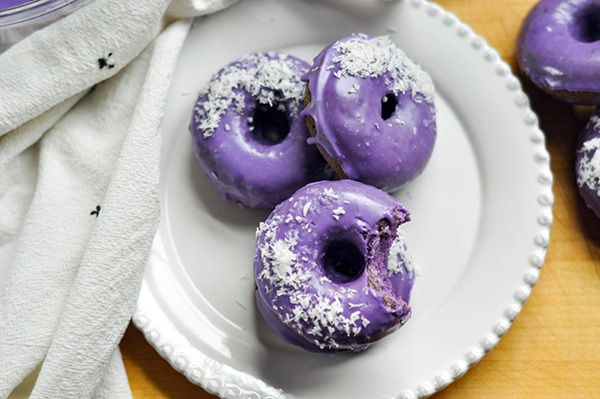 And now these Ube Donuts with Coconut Glaze are definitely making that list. 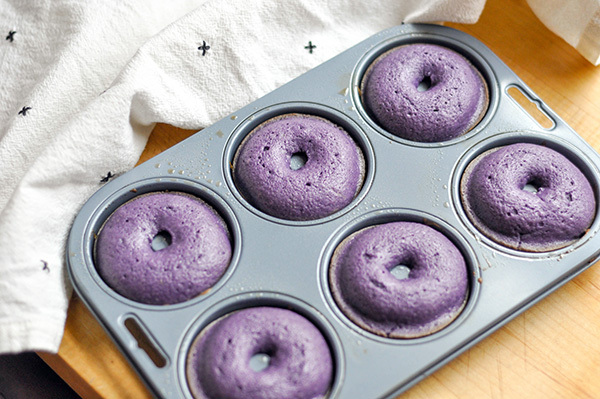 This cake donut is soft, fluffy and tinged in a beautiful violet crumb. The flavor of ube is sweet, earthy and creamy. It's then perfectly complimented by the smooth tropical flavor of the coconut glaze. These donuts start with a simple batter, much like a muffin batter. The wet ingredients get mixed together including this gloriously beautiful violet ube extract. The the dry ingredients get added and it's all spooned into a greased donut pan. On a side note, I only have one small pan so I did this in multiple batches. Once baked I cooled them on a wire rack and prepared the glaze. 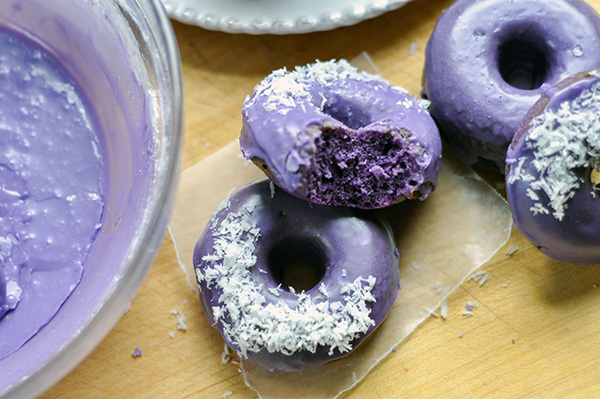 This glaze is a mixture of powdered sugar, coconut milk and ube extract. Whisk these ingredients together till it becomes smooth. Once the donuts are cooled, dip the tops of the donuts into the glaze and place back on the wire rack to set. Sprinkle on the unsweetened shredded coconut and just try not to eat all of them in one sitting! Mix together oil, buttermilk, eggs, sugar, salt, baking powder and ube extract until combined. Stir in flour and mix until smooth. Spoon the batter into the donut to about 3/4 full. while they cool make the glaze by whisking together the powdered sugar, milk and ube extract. once cooled, dip each donut halfway into the glaze and place on a wire rack to dry. Sprinkle with coconut flake if desired.